Nature receives you with open arms. Herdade da Cortesia is literally part of Avis. The hotel building is an organic element of Alentejo's landscape and resembles a tree leaf that falls to the ground and is confused with the natural setting. Come visit and find it. This project was born from a story of meetings between athletes, investors and of those who, inside this pure setting, found moments of sublime rest. The flora and the local tree groves were respected, creating a special environment together with the innovative architecture, in which the line between interior and exterior is almost invisible. The common areas branch off from the central body of the building. Organic passages extend themselves in the space to unite the restaurant, bar and exteriors. Here and there we are invited to stop and relax in cozy living spaces or, through a step, enter nature. 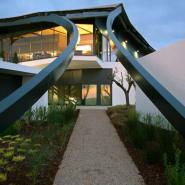 The rooms are implanted in modules of two at ground level and follow its whims, curve by curve. The colours are of a welcoming palette of Alentejo tones and each room has its own personality to be discovered, as well as singular views to the town of Avis, the Maranhão lake, the extensive plain or the swimming pool. In this land the environment refines the taste buds and the chef fulfills your desires with regional gastronomy dishes interpreted in a modern way. They are new recipes, with a delicious taste, that you will discover in the company of nature lurking in every window. From Lisbon take the A2 in direction of the Algarve, South of Portugal. Exit onto the A6 in direction of Évora / Espanha, and then take exit 4 in direction of Arraiolos. In Arraiolos follow in the direction of Paiva and then to Avis.